The nasal sinuses are usually lined with paper-thin bone and thus have a high tendency to sustain a fracture during trauma. Although not functionally as debilitating as other fractures of the facial bones, sinus fractures can lead to a lifetime of sinus disease. As such, sinus issues should be treated by a facial plastic surgeon that has extensive training in sinus surgery as an otolaryngologist (ENT). The sinuses are air-filled cavities inside of the skull that serve several purposes. There are 4 sets of sinuses (maxillary, ethmoid, frontal and sphenoid), and they are mainly distributed around the eyes. Besides making the skull lighter, sinuses also seem to have a protective role during trauma. It appears that the air filled cavities can reduce the impact of blunt trauma to surrounding vital structures such as the brain or eyes. The maxillary sinuses sit below the eyes within the cheek region and seem to play a major role in protecting the eyes during trauma. Ethmoid sinuses sit just medial to the eyes on both sides and also play a role in protecting the eyes from the effects of blunt trauma. The frontal sinuses on the other hand are located above the nose within the midline region of the forehead; they seem to play a role in absorbing the force of trauma and protecting the brain that is located directly posterior. Figure 1: Front (top) and side (bottom) view of the nasal cavity showing the locations of frontal, ethmoid, maxillary and sphenoid sinuses. How do I know if I have a sinus fracture? There are several signs and symptoms of a sinus fracture. These are specific to the location of the affected sinus. Fractures of the maxillary sinuses are usually coupled with cheekbone fractures. In cases of isolated maxillary sinus fractures, you may notice air under the skin of the cheek or notice bleeding during nose blowing. However, isolated maxillary sinus fractures can easily go undiagnosed, as very few symptoms are associated with them. Fractures of the ethmoid sinus are almost always associated with an orbital blowout fracture and would be diagnosed and treated accordingly. When a fracture involves the frontal sinus, you may notice a depression of the forehead. There may also be some bleeding from the nose. If the fracture involves the back wall of the frontal sinus it may cause leakage of the fluid surrounding the brain, cerebral spinal fluid (CSF). This usually manifests as a clear runny nose that worsens with squatting. It may also feel like salt water is trickling down the back of the throat. I think I have a sinus fracture. Now what? 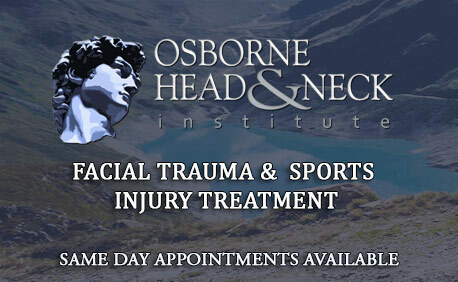 If you think you have a sinus fracture then you should see your facial trauma specialist to confirm the diagnosis. This is typically done with a CT scan of the head and can determine if there was any damage to the surrounding structures. How is my fracture repaired? The manner in which your sinus fracture is repaired is dependent on two factors, location and extent of damage. Ethmoid sinus fractures are typically not repaired. If any repair is needed, it is done in conjunction with an orbital blow out fracture repair. Similarly, maxillary sinus fractures may also not require repair. This is especially true if fractured pieces of bone are not displaced. However, in cases of severe displacement, repair is required. In these instances repair can be performed through a small incision on the inside of the gum line. The fractured bones are then placed back into their original locations and secured with thin titanium plates. Frontal sinus fractures will always require intervention. If the fracture does not involve the drainage pathway of the sinus and brain, then simple routine follow up with repeated CT scans are all that is required. However, if the fracture involves the drainage pathway or has caused CSF leakage, the fracture will need to be surgically reduced and plated. In addition the sinus will likely need to be closed by stripping it of its inner lining and filling it.